Recently, I’ve noticed that Go Daddy appears to be promoting its Domain Buy Service more heavily on default landing pages. Have a look at the screenshots below, and as you can see in the first screenshot, the most prominent link on the page is a link to “Learn how you can get this domain,” which links to the page with information about Go Daddy’s Domain Buy Service. The other screenshots show other variations of the default landing page. If you aren’t familiar with the Domain Buy Service, it allows people to inquire about domain names that are privately owned. 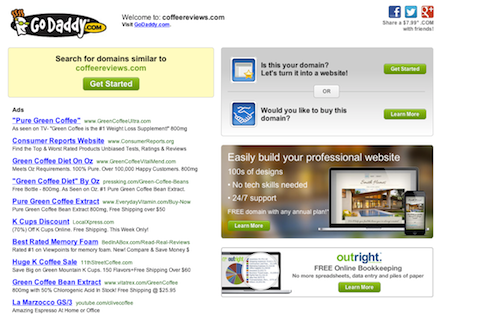 The cost is $59.99 per domain name, and the buyer pays a 10% commission if a deal is struck. A representative from GoDaddy will negotiate on the buyer’s behalf in an attempt to close a deal. My guess is that Go Daddy istesting its landing pages and the offers that are presented to visitors. Some have PPC links and others promote internal products such as website hosting and web design services. By promoting the Domain Buy Service, the company is encouraging aftermarket purchases rather than hand registrations, and I think that is good for all of us. One reason I think it’s interesting (and beneficial) to domain investors is that it may help introduce the idea of aftermarket acquisitions and negotiations to otherwise oblivious end users. As obvious as the domain aftermarket is to us, there are many people who have no clue how it works. 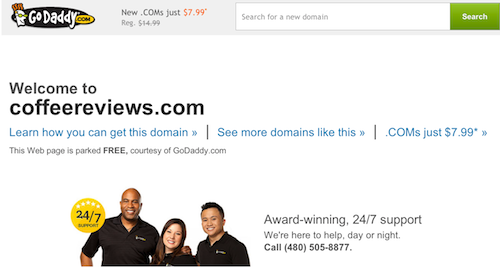 With the reach of Go Daddy, it is introducing aftermarket domain purchases to the masses. I also think this has additional benefits for other parties. For Go Daddy, the $60 fee probably generates much more income than PPC links. The conversion rate is probably low, but if they get one DBS sale for every 120 click that would generate $.50, they are even money, and they make more when they close the deal. Further, domain owners who haven’t developed their domain names may benefit if they are able to close a deal on a hand registered domain name. They also benefit because there is less risk with this lander (in my opinion) than one with PPC links that could be used by a TM holder against a domain owner. Finally, end user buyers have the opportunity to purchase a domain name in the aftermarket that they might not have known how to buy. I’d be interested in knowing how this landing page is performing. I guess we’ll likely know based on the increase in visibility over the coming months. Godaddy users have been less than productive for me. My first introduction to them was when Sedo cross posted its listings as “Godaddy Auctions”. Which aren’t auctions at all. That led to tremendous confusion with the uneducated masses thinking they could own a domain for whatever they “won” it for. Agree with Josh, ended up deleting 5000 names from Godaddy with the cross promotion with sedo, and the onslaught of $60 offers. The Domain Buy service does work well in closing deals with solid end users who are just unaware of the whole process, it should lead to some nice sales. The basic lander advertising GoDaddy’s services seems to show up with the first visit even with different browsers and subsequent visits show the lander for the domain buy service (for me anyway). The first lander has a small ‘want to buy this domain’ that probably doesn’t get much attention. Not sure if this is how it is will all of their parked domains but it is an interesting strategy. I don’t use GoDaddy’s default landers but for those who do, it would be nice if they could select the specific lander that they wanted. Maybe GoDaddy does offer something like that in their parking program. Morning Kiddies. Professor Saggy here. 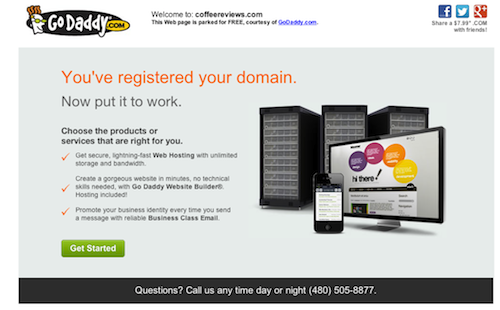 Today’s lesson is on the boneheads at Godaddy and their boneheaded Domain Buy Service. The Saggy has fielded offers through the years via the Domain Buy Service and has NEVER once taken the bait. There are several things wrong with that service. For one, it’s commission based so you’d think it would serve the interests of the virginal brokers at Godaddy to put in HIGH offers. But I kid you not. All the offers that ever come from Godaddy are so low I wouldn’t even let a rabid dog hump it. What’s up Godaddy? Are you nuts? I could list the other 10 reasons NOT to ever go with the Godaddy Buy Service but right now I have to “service” a girl. I received my first ever offer through the Godaddy Domain Buy Service this week for a name at about $1,000. You would think since they do work commission they would be more reasonable. The first offer to come through was $100. I thought about ignoring it until the second offer was $400. Maybe we are getting somewhere? Not sure how these function but my guess is they are end users that need these names. Otherwise, there are more cost effective ways of doing it. If we get close to $1,000 I’ll take the deal. I suppose it’s positive to look at the zero cost to me the seller. Hey Nickel bag. The first part of the GD offer process is obviously automated. No human intervention at all. you can tell. Mr robo-mail sends it out and if you reply then they may engage further. Us sheep herders over here have closed a couple in the upper 4 figures and one 5 figure thanks to the fine work of the robo-mailer and the godaddy broker who called us after we went to go look at the offer and ignored it. Safely collecting parking revenue has gotten a little more dangerous for GoDaddy with the ruling on the oscar related typo. A lot of people are focusing more on sales. Is there a trend recently where everyone is seeing less and less revenue (more than usual) from Google syndication feeds? How many are getting booted from being eligible from being able to serve up Google’s feed. These are the questions we need answers to. I’m sure GoDaddy is generating a strong revenue stream from these landers. At DomainAgents we work with domain owners who are generating strong leads and sales by redirecting domains to our pages that are similar to this.